Iron Free Hoof is your premier on-line hoof resource. Do you want general hoof knowledge to round out your understanding of horse care? Or, do you need in-depth information because of a crisis situation? A lame horse certainly spurs many horse owners into studying hooves. That is the reason I began this journey. I needed to understand the mechanics of the hoof, so that I could help my horses. I needed to know if the hoof care they were receiving was indeed the best I could provide. I take you through basic hoof anatomy and hoof trimming instruction and progress to more in-depth information. Horse hooves are deceptively complicated. Externally, there are not many structures. There are the walls, sole, bars and frog. But, there is much more. Iron Free Hoof takes you inside the hoof, shows you the structures and helps you understand their inter-connectivity. The equine foot is extremely adaptable. It responds to internal and external forces. Understand how the whole body influences the hooves and how the hooves influence the body. See how diet and environment play a part in hoof health and soundness of the horse. Expand your hoof care knowledge and feel more comfortable making hoof care decisions. Understand injuries and lamenesses better. Learn how to read the hoof and to understand the information that hooves reveal. Natural hoof care is my passion and teaching is my joy! I find knowledge empowering and strive to share all I know so that you can feel confident too. Together, we can help the horses we love. I start with the external horse hoof anatomy and build to the deeper more complex inner workings of the foot. My goal is to expand the three dimensional understanding of the hoof. Here is detailed hoof anatomy after removing the hoof capsule. See the lamina under the hoof walls and bars, papillae under the coronary band, frog and sole of the hoof. Very clear photos of the tendons and ligaments in the equine distal limb. A good place to start learning about the distal limb is by looking at hoof anatomy and bones of the lower leg. Checking equine digital pulses is an important management tool. To begin learning, look at hoof anatomy and leg structure. When trimming hooves, it is useful to visualize how the lamina taper. Determining hoof balance is a good first step for natural hoof trimming. Hooves work best when all the parts are functioning properly. 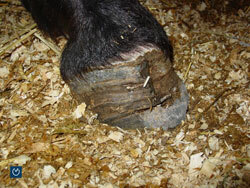 Each part of the hoof has a purpose and natural hoof trimming encourages each structure to perform well. Proper trimming is a key element of natural hoof care for horses. Here is a series of photos showing a naturally trimmed hoof. Horse hoof trimming needn't be complicated and examples teach the best. I think the more you can see, the better you will understand. Recommended trimming schedule for different hoof care situations. The story of Druid who not only survived, but healed and became a beloved therapeutic riding horse. Paige Poss offers a variety of clinics. Whether you are interested in hoof anatomy, natural hoof trimming, or tool use, she can tailor a clinic to suit your needs. Have a question about horse hooves? Contact Paige Poss. Paige Poss is a hoof care specialists excited to share her in depth knowledge of the equine hoof. Laminitis in horses is usually recognized because a horse is in pain. Understanding laminitis helps the equine caregiver alleviate the pain.